Fresh, bright lemon zest, fresh pineapple and white floral notes lift from the glass of this bright, clean Sauvignon Blanc, which a very subtle hint of vanilla and caramel add balance and complexity. True to the Keever style, the wine displays a balanced acidity paired with a crisp, dry finish, and stands alone as gracefully as it pairs with lighter-style meals. This 2015 Inspirado shows gorgeous dark cherry and spiced plum aromas, along with floral notes, cedar, warm earth notes and a hint of vanilla. Three spectacular vintages - including two 95 pointers! 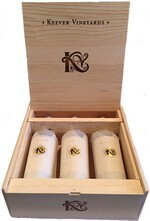 - all packaged toghether in one beautiful wooden box. 2010, 2011, and 2012 Cabernet Sauvignon. Cheers! This fully ripe Cabernet Sauvignon shows intensely aromatic tones of spiced plums, cranberry, cherry tobacco, fresh sage, and a note of warm toasty vanilla. On the palate the texture is immediately broad and plush, with bright, fresh berry notes and dusty mocha/dark cherry flavors. A mélange of aromas ranging from bright raspberry and cherry notes to dark purple notes of cassis and boysenberry. The ripe fruit aromas combine with more subtle tones of cedar, baking spices and vanilla. Bright purple aromas of boysenberry, mulberry, and warm summer briars invite a closer look at this fully ripe Cabernet. Plush and satiny at entry, the purple fruit flavors are enveloped in mocha, vanilla and warm spice tones.